The Kings of Rock`n`Roll . Austria `s TOP Rock`n`Roll Band starts full steam ahead on there debut album with a musical time journey back into & the 50's & 60`s, and it appears desperate for the listener to keep arms and legs still calm. From his character reminds the typical „Kings of Rock`n`Roll-Sound“ to the good old times of Rock `n `Roll legends like Elvis Presley, Jerry Lee Lewis, Bill Haley and The Comets, Little Richard, Fats Domino, Chuck Berry,…. A sound which makes joy and an absolute must for all, which like good (and original) music! Rough, with a show which is not designed, and which is unique by all performances, with such a show trek the five the musicians of R & R-formation „The Kings of Rock`n`Roll “ now for 14 years through clubs and they are common also frequently on large festivals. These many live-experiences is processed now on their studio project with the title „NEWS from the FIFTIES & SIXTIES “, in order to make their „good mood music“ accessible for everyone. 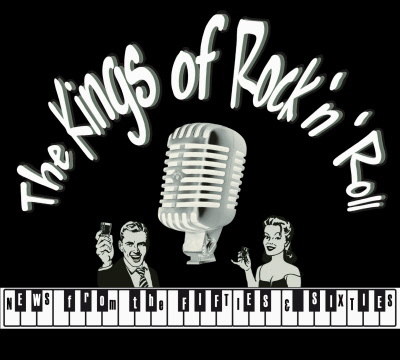 The first of eleven titles gives the direction for the program: „THE KINGS OF ROCK `N `ROLL ARE BACKE IN TOWN“! “Full steam ahead” this is the way how the band starts, a musical time trip with the typical sound of the 50's & 60's, and it appears desperate for the listener to keep arms and legs still calm. Singer and guitarist Wolf W. ”Wild” King operates with his variant-rich voice and the unmistakable harmonious rhythmic on the guitar all Rock `n` Roll genre of the 50's & 60`s. The full grooves of bass player Joe “BIG” King and Drummer Gerardo “Al TONNO” King drive the rhythm really along. Keyboardist Robby “SHADOW “King performs magic wonderful nostalgically warm organ sounds and hot piano sounds. Saxophonist Tom “TORNADO” King supplemental with his brilliant Solis and rhythm parts the typical „Kings of Rock`n`Roll-Sound“ which reminds to the good old times of Rock `n `Roll legends like Elvis Presley, Jerry Lee Lewis, Bill Haley and The Comets, Little Richard, Fats Domino, Chuck Berry,…. A sound which makes joy and an absolute must for all, which like good (and original) music!